This guide will help you create a simple web application with Spring Boot. We will add static content (css and js) and use it from a JSP view. How to add static content - JS and CSS? SpringBootWebApplicationBootstrapJqueryApplication.java - Spring Boot Application class. 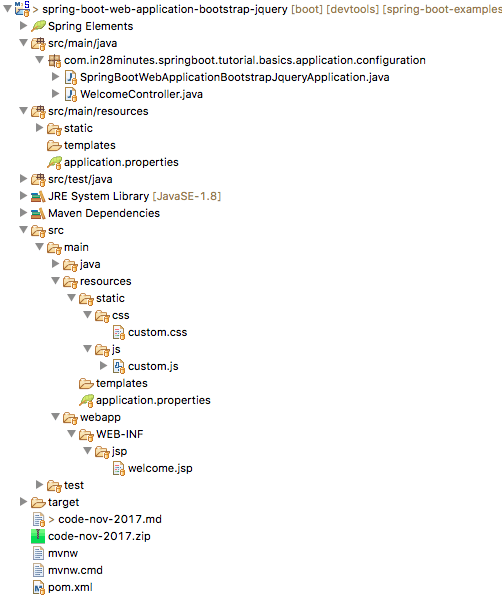 This initializes the Spring Boot application with auto configuration. welcome.jsp - The view - using the custom js and css. custom.css - contains some basic css. The recommended folder for static content is /src/main/resources/static. We will create the css as shown below. It give a light blue background color to the body of the page. Complete updated view is shown below.